A herniated disk refers to a problem with one of the rubbery cushions (disks) between the individual bones (vertebrae) that stack up to make your spine, which is made up of 24 movable vertebrae. Between each one is a cushion called a disc. These discs act as shock absorbers for your spine, keeping it flexible. When a disc is harmed, it can bulge or break open, which is known as a herniated disc; this condition can also be referred to as a slipped or ruptured disc. 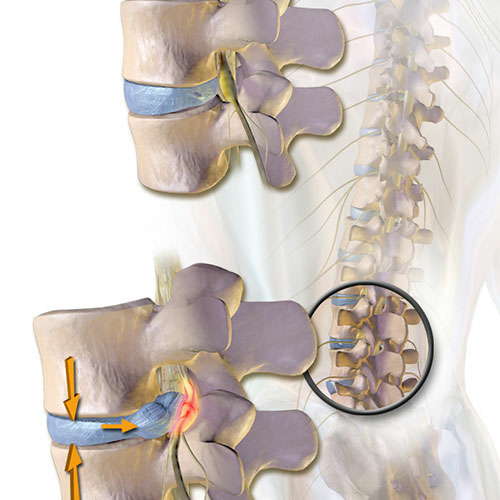 Herniated discs can be caused by either injury or age. As you get older, the discs will start to wear out and their flexibility will decrease. Injury or heavy physical movements can cause the outer layer of the disc to start to crack, which causes the inside to be forced out onto nerves. You can actually have a herniated disc without knowing it; however, some cases can cause serious pain. If the herniated disc presses onto the nerve roots, a person will experience pain, numbness, and weakness in the part of the body that those nerves travel to. If it is not pressing on a nerve, a person may experience a slight backache, or perhaps no pain at all. Herniated discs can occur at any level of your spine, but they are most often seen in the lumbar (lower) spine and the cervical (neck) spine. They occur most commonly in the lower spine, since that part of your back typically moves the most throughout the day. If it occurs in your lower spine, a common symptom is pain that moves down the leg to the foot. You may also experience some weakness in certain leg muscles. If the herniation is in your neck, the pain, weakness, and numbness will be felt in the upper arms, shoulders, hands, and fingers. Regardless of the location of the herniated disc, you may find that certain movements, coughing, or sneezing can increase the pain. To be diagnosed with a herniated disc, your doctor will typically perform a physical exam and then ask questions about your symptoms. Occasionally, for confirmation or to rule out other factors, you may need to get an MRI or CAT scan. The symptoms will usually get better in a few weeks to about a month; although if they do not, your doctor may recommend a spinal decompression, either surgical or non-surgical, to help your herniated disc. To speed your recovery, your doctor will typically advise resting, light exercises to strengthen muscles, and hot and cold compresses. Regular exercise and protecting your back when you lift something heavy will lower your risk of suffering from a herniated disc again in the future. While most people who have a herniated disk don’t need surgery to correct the problem, it can irritate nearby nerves and result in pain, numbness or weakness in an arm or leg. Contact the pain management experts at the Florida Spine Institute for a proper diagnosis and treatment options.